What made you decide to get an MFA, and where were you in your writing and the rest of your professional life when you decided to go for the degree? Time to write was the reason I decided to get an MFA. I figured I’d have at least two years of uninterrupted writing time. I’d been working full-time at a literary nonprofit for 7+ years. Though I enjoyed the work, I was always tapped out by day’s end. My professional life was flourishing, while my creative life suffered. I very consciously decided to go back to school. I’ve not looked back since nor thought twice about my decision. What does a typical workday look like for you — where, how, and how often does your own writing fit in? I love what I do! Working at Cave Canem Foundation feeds me in a way that no other job has. A typical day at Cave Canem is atypical–each day really does vary one from the other. I write during my commute, after work and on weekends. I’m not a writer who wakes with the sun and writes for hours every morning…I’m pretty useless before 8 am. What skills and strengths does your day job involve that you feel you had already when you started it; what have you had to learn on the job or improve along the way? I’ve planned programs of the highest quality for years. Nothing, however, prepared me for the pace at which programming is planned at Cave Canem. This fast-pacedness is actually one of the many thrilling things about the job. There’s never a dull moment, never an opportunity for boredom. If you didn’t have to do your job to pay the bills, would you still do it? Absolutely–my job inspires and motivates me! You’re the Programs Director for Cave Canem, an organization of which you’re an alum. How did the Cave Canem fellowship experience impact your writing differently than the MFA did? If you were advising a young poet of color, which would you recommend they experience first? As a graduate fellow, I would have no MFA were it not for Cave Canem. Beyond confidence, Cave Canem invited me into a community, gave me much-needed artist tools and helped me find my voice. The MFA worked for me because I’d already received much of what I needed as an artist. I’d rather not use myself as a measure, so I would invite young poets of color to take from my experience what they will. What’s it like to work for an organization whose programs you experienced as a participant? It’s cool to experience Cave Canem’s programs from this vantage point. From inception and promotion to administration and evaluation, I get to see firsthand the great effort and hard work that goes into each program. And, our constituents deserve nothing less that great effort and hard work on their behalf. What advice do you wish you could have given yourself as a writer ten years ago? My husband always says that publishing is cheap and easy… and he’s right. It is easier to publish an underwhelming poem than it is to write a compelling one. I’d advise my younger self (like I advise my current self) to write poems that have the capacity to endure. Born in St. Thomas, U.S.V.I. and raised in Apopka, Florida, Nicole Sealey is the author of Ordinary Beast, forthcoming from Ecco in fall 2017, and The Animal After Whom Other Animals Are Named, winner of the 2015 Drinking Gourd Chapbook Poetry Prize. 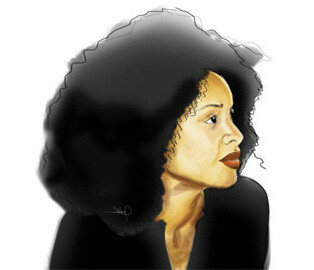 Her other honors include an Elizabeth George Foundation Grant, the Stanley Kunitz Memorial Prize from The American Poetry Review, a Daniel Varoujan Award and the Poetry International Prize, as well as fellowships from CantoMundo, Cave Canem, MacDowell Colony and the Poetry Project. Her work has appeared in The New Yorker and elsewhere. Nicole holds an MLA in Africana Studies from the University of South Florida and an MFA in creative writing from New York University. She is the Programs Director at Cave Canem Foundation. This entry was posted in interviews, Uncategorized and tagged cave canem, non-profits, poetry by truncatedbiographer. Bookmark the permalink.